This is Part 5/5 of a recent Heaven Hill tasting I attended where I tried five bourbons. I also had the chance to meet their international representative Mr. Henry Joe. Ok so here's the deal. I love Parkers Heritage. And I've managed to put Editions 3,4 & 5 safely on my shelf for all to admire. I remember first purchasing the 3rd Edition wondering what I was getting into and then proceeding to get blown away. I've always felt mixing rye with wheat is a tricky exercise because they tend to fight or cancel each other out. But not here. This one was one of the favourites of @WhiskyJoe and myself at the recent tasting...thanks so much for bringing it along @Victor! I loved the peanut butter/peanut brittle note that jumped right out at me on the nose and palate. Fiery thick sweet spicy arrival develops a warm vegetable long slow finish. Every Edition Parker's Heritage Collection Bourbon is unique. Your only identifier here is the 68.95% ABV, which tells us that this is the Four Grain (wheat AND rye) Mashbill Parker's Heritage Collection Bourbon. Not sure which year this was. I think it was the 2013 if I'm not mistaken. Nose: Butter scotch, artificial cherry cough drop flavor, vanilla, figs, all spice. Palate: Luxurious thickness and mouthfeel; butter scotch, bitter oak that smoothed out with time in the glass and a touch of water; maple syrup, toasted Challah bread, butter, rye. Finish: fairly long; cactus syrup, caramel, oak. This bourbon exemplifies the reason I tend to favor scotch. It just didn't deliver for me. I would have enjoyed even a Highland Park 12 year, Aberlour 12, Glenfarclas 10 or 12, or a Clynelish 14 year more than this premium bourbon. Sorry, it's just one man's opinion. This said, I really do love Pappy's 15, Bookers, and a few bottles of Buffalo Trace that were absolutely amazing over the past year. So I'm not a complete bourbon "heathen." This said, I've tasted more Buffalo Traces that disappointed over the past year than enchanted my senses because of a few freakishly good bottles that were as tasty in the basic midrange palate as Bookers although not nearly as complex or lingering in the finish, of course. Those bottles spoiled me. I'm sorry to say that I didn't own either of them. I came across them in bars in my neighborhood. Last winter/fall seems to have been a very good time to buy B. Trace, at least in Oregon. As for the Pappy's, well, I will always try to get my hands on a bottle of that, so long as it stays almost as good as the 2011, which blew my socks off. It seems to be slipping a tad in terms of overall bombastic greatness, but not too much. Haven't had the 2013 - I think I have the 2010 which I've sampled and which is quite genuinely off the hook! Parker Beam is a legend in the whiskey industry. He selected a couple of great casks from his 49 warehouses at Heaven Hill and bottles these in a series called Parker’s Heritage Collection. In an interview, Parker told us in his typical Southern drawl: ‘The barrels I have selected for this series represent some of the finest and most diverse whiskeys I have produced in my 45 years as a Master Distiller. I think they will pique the interest of many of today's whiskey aficionados.’ This is the fourth release, by the way, a 10 Year Old wheated bourbon. The nose is somewhat hot and prickly, but that evaporates rather quickly. Then it turns sweet on young corn, dark bread and vanilla with a nice touch of mint. Hints of maple syrup makes it a bit rummy (is that a word? ), as if it contains sugar cane. The attack is powerful and spicy. Loads of oak, actually. Very sweet again. The rummy character lingers somewhat, which is not a disadvantage. I even get some apple brandy. The finish is a bit too short to my taste, with an fresh uplift from the mint. It can take water (the nose becomes a tad less interesting, but the palate remains good), but does not really need it. Thanks, Kris! Sorry, I was thinking of the Woodford Reserve. Never tasted this one. This was one of my earlier purchases and I hadn't tasted it in a long time. I just remembered that it was good. How good? I had totally forgotten! As the long, oily and spicy finish hints of boiled sweets and cigar box you can't help but salivate at the thought of the next sip. A must-have winter night dram - preferably out in the open fields. Great review, but what edition of the PHC has been reviewed here, and what is the abv? I have the 4th edition (10 yr old, wheated bourbon at cask strength (62% abv or so, iirc), which is awesome) and an unopened bottle of the 5th edition (10 yr old rye bourbon @ 50% abv, finished in cognac casks for 3-6 months)that I am really looking forward to opening. My understanding is that the mashbill for the 5th is the same as what is picked for Evan Williams Single Barrel releases at basically the same age, only issued at the higher abv (EWSB is 43%), with the extra cognac cask finishing. @Pudge72 I've reviewed the 5th edition -- I suggest you open it when you have a couple of hours all to your self. I'm surprised that the mashbill is the same as the EWSB. I'll have to look that up. If that's the case then I guess the Cognac cask really made the difference! Nose: Rather fruity (cherries and other pit fruit) at first. Shaved wood dust and corn sweetness. Honey-maple and dry coconut, and wood. Drop of cinnamon liqueur. Rich. Seems to be more than there is, but what's there is very good. Far softer wood. (with water) It's great, and needs to stay around or over 50% - below that and it loses too much - wood, great, simple wheat sweetness, vanilla, and candied almonds. Palate: Honey, eggy French toast, dark cocoa, cedar, and cigars. A bit hot, but I really like this in drips and drops. Slightly acidic, leading to a bit of green apple at the mid-palate. (with water) great, simple honey-caramel sweetness, a light dollop of wood, corn, and more French toast. Finish: Fades to great wood, and has just what a good wheater should have. Dry - not drying - wood finish. (with water) a little spicy and more French toast. some charred wood (ashy and earthy). Not sure whether I prefer it neat. It's got some residual heat, and it's extremely good. Well its good to get back on here....Life, work, kids...ahhh. So my thoughts on this one are slightly biased for two reasons. One, I am partial to wheated bourbons...love them, aside from the Pappy craze (lets not forget that Pappy is still great whiskey, even if the hype is beyond annoying). Secondly, I racked this open last week on a fishing/camping trip in a northern lake in Maine..so my mindset was already in paradise. I had two bottles of this saved, so I figured our once a year trip to the woods is the best reason to bring mybest juice. This bourbon is fantastic. I agree with the french toast palate. I think its the woody aspect that creates the "toast" in the french toast flavor. I tried it neat and with a few drops of delicious filtered northern Maine lake water. The water was great :) But I liked it better neat. A fantastic pour. This thing had long legs in my plastic cup, if that is possible. I compare it to the Wellers 12 year old with a bit more complexity. it finishes long like the wellers, but I found there to be an almost cherry cough drop finish there, but somehow not in a bad way? Anyways, its one of my top 10 bourbons ever..so that is saying something. However I still wonder if the call of the loons on the lake as I watched the sun set had any influence on how much I was enjoying this pour. @numen, thanks for this excellent review. This is the first review, other than from Mr. Murray, which I have seen of this particular expression, which is also known as Parkers Heritage Fourth Edition 10 yo (wheated). I have a special interest in this one because I have an unopened bottle of it. This review is for Parker's Heritage Collection Golden Anniversary Bourbon. Released in 2009, this is the 3rd Edition in the series produced by Heaven Hill Distillery and master distiller Parker Beam. Golden Anniversary is in celebration of Parker Beam's years of service with spirits from five different decades vatted together to make this a very unique and delicious whiskey. Barrels from the 3rd thru the highest floors of the rick house are represented with the oldest barrels/spirit being from 1968! Only 4500 bottles were released. Recognized by Whisky Magazine as the "Best New Release" in 2010 and Malt Advocate naming it "American Whiskey of the Year" 2010, the awards and high ratings are well deserved. Tasting was performed in a 16 oz. snifter, neat. Nose: A symphony of well blended aromas of rich vanilla, some mint, oak hints, leather, citrus. Palate: Very smooth and silky oil feel in the mouth, subtle sweet, citrus, then oak, followed with a dash of spice, pepper and again soft sweet notes. Finish: Long lasting enjoyable smooth finish with a wonderful balance of all the aromas and flavors mingling together artfully. Minty, controlled oak, dancing bliss on the taste buds. Balance: This is without a doubt one of my favorite whiskey's in my collection. With only 4500 bottles released, it's somewhat hard to believe this expression remains fairly available (the price tag of $150 helps support a longer shelf presence) but inventories are getting thin. I'll be sure to be adding to my two bottles already in the cabinet in order to enjoy this for years to come. SO SMOOTH! This review is for Parker's Heritage Collection 10 Year Old 4th Edition. A wheated bourbon bottled in 2010, this is the 2nd dump sister of the first offering bottled earlier in the year (as Mr. Parker determined that all the barrels weren't quite ready at the same time). The first dump had slightly more ABV of 63.9%. Produced by Heaven Hill Distillery, this is an expression pulled together from select barrels by famed master distiller Parker Beam (of the famous Jim Beam Bourbon family). Dram tested in a 12 oz. snifter, neat, slight hand warming. Nose: Molten brown sugar, ripe bananas, oak wrapped in vanilla. Ah, smells like freshly made Bananas Foster after a flambe presentation. Palate: Smooth oily viscosity coats the mouth with well balanced dry sweetness with oak dovetailed in a shake of red pepper giving way to an E-Z dryish fade. Finish: Nice follow thru package of not overly sweet brown sugar, pepper, vanilla oak covering the tongue evenly as the hints of all gradually release the senses into a calm peaceful place. Balance: This cask strength non-chilled filtered expression is one smooth bourbon whiskey. For those who like "wheaters", this is a bottle that should be "parked" in the cabinet. With only 4800 bottles produced, this is something special and might want to consider grabbing a couple extras for the bunker. 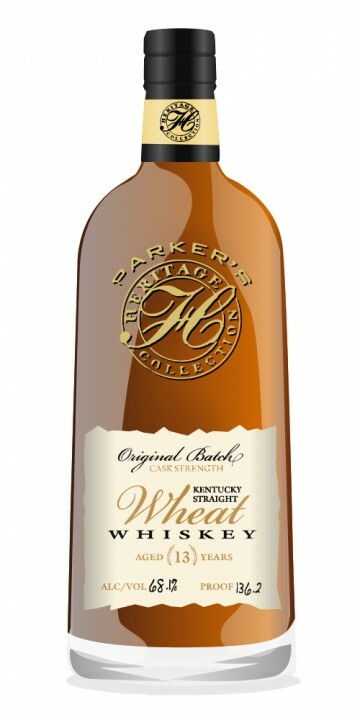 @stevesmyth30, yes, what's not to like with Parker's Heritage Collection 10 year old wheated bourbon? Oh, ok, maybe the length of the name. Excellent stuff. I still remember my taste of it with @dbk and @Pudge72 from a year ago. More recently I get my sips of this 4.2 release at my sister's house (she was also with the three of us that evening in Hamilton). I do own bottles of the Fourth Edition 127.8 proof and Fifth Edition 100 proof Cognac Finish versions. @dbk, I am with you completely that it would be a pity if Heaven Hill were not to keep these beauties coming. An ongoing formal line would seem to be a good idea. I fell in love with this bourbon instantly. It is, quite honestly, in my top 5 all time pours for bourbon. I loved it so much, I went back and grabbed the last two bottles to "park" in the back of my cabinet, as they seem to be going fast. Its funny that Pudge mentions the cocoa here. I picked up on this right away. Not in a bad way at all, just complex. I agree with the "oily" coating in my mouth...just stays there for weeks. And next time you pour this one, make sure you note the legs in the glass....this pour just hangs on the side of the glass for minutes. Overall a rich, substantial bourbon that honestly changes each time I sip it, and so far not one change for the worse. The next test is to pair it woth a good cigar and see how it holds up...i'm thinking it will hang in there with my Islay scotches. Drank with 3 ice cubes. Palate: Delicious! Belgian chocolate, Mexican vanilla, Canadian maple, hay, rain water. I tried the Golden Anniversary edition recently and I was pretty disappointed. It's quite dry and oaky, and the price is too high (at least here in Europe, where we pay around € 140).